Reserve your table for Thursday, April 25, 2019! 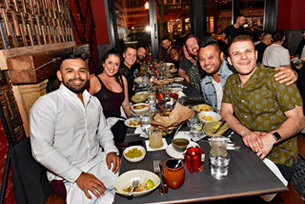 TPAN is inviting thousands of Chicagoans and supporters—including LGBT advocates, HIV care and service supporters and allies—to Dining Out For Life Chicago on April 25th. 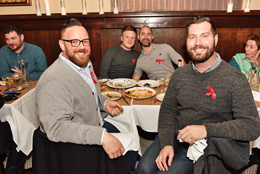 By dining out with friends at any of the participating locations, you help support compassionate health care and services for people affected by HIV and health disparities across Chicago. You can also join our effort by purchasing a $5 raffle ticket to have a chance at winning one of several high-end prizes. We invite food-lovers, friends, and restaurant folks across our great city to be a part of this fun and unique event. Check out our participating restaurants! Check back often as as we add new restaurants all the time! It's not too late to nominate your favorite dining spot! Check out our cover ad in the January issue of Positively Aware magazine! Become a Dining Out For Life Restaurant! Restaurant, diners and food establishments are the heart of Dining Out For Life! If you would like your establishment to be involved, here's how! Chicago restaurant owners know that cause-conscious patrons are drawn to dining experiences with purpose. Last year, Dining Out For Life Chicago drew thousands patrons through a city-wide advertising campaign and a team of volunteer Ambassadors. Don’t miss your chance to get involved and join a prestigious network of like-minded restaurateurs! Dining Out For Life restaurants agree to donate a predetermined amount or a percentage of sales from Thursday, April 25th to benefit TPAN’s mission. Our goal is to drive new diners to your restaurant on April 25! Your restaurant's name and contact information will become a part of national and Chicago-area campaigns. A broad community of people who support HIV and LGBT-focused mission work will be invited to dine at your establishment on April 25th. 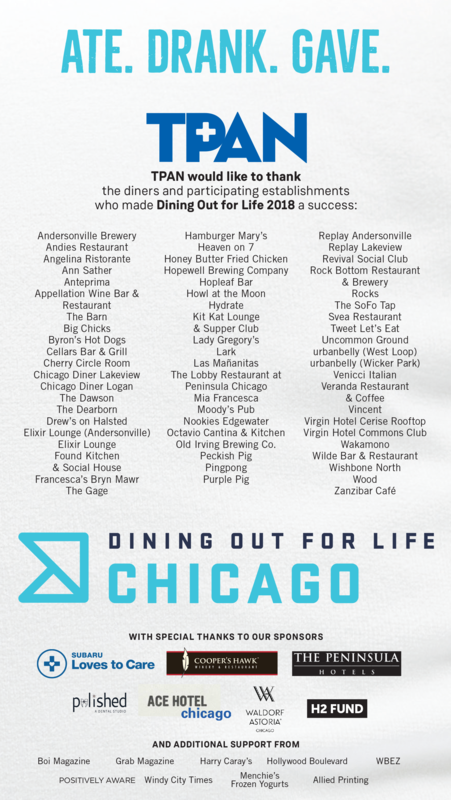 We want to celebrate your restaurant to let all everyone know that you are part of Dining Out For Life Chicago! A targeted local TV digital and print media outreach campaign, including in our well-known magazine, Positively Aware. Promote your restaurant on the Dining Out For Life Chicago social media network. Your team members (servers, managers and other restaurant personnel) will be trained how to help recognize the event among your customers. On event night a TPAN volunteer Ambassador will be onsite at your restaurant to help thank your diners, share event information, share information about TPAN’s impact, answer questions, and as appropriate, invite contributions from patrons who wish to support TPAN's mission. After the event, restaurants make a donation to TPAN based on sales for the evening or a predetermined amount. The Dining Out For Life Ambassador Program is an excellent way to get involved in sharing TPAN's mission and message. If you like interacting and talking with people, this is for you! Each Ambassador is assigned to a local participating restaurant to represent TPAN on April 25th. We’ll make sure you have everything you need to be ready for event night. Every Ambassador receives easy, fun, and inspiring training from our TPAN team to help make the event and its mission a success. Encourage your friends, co-workers and family members to come to your assigned restaurant on April 25th! Serving as a Dining Out For Life Ambassador is a fun and easy way to support TPAN’s mission and clients! Do you love dining out? Why not make what you enjoy an act a force for life-changing care and services right here in Chicago! Being a Host for Dining Out For Life is a fun and easy way to be part of the experience. Through the simple act of dining out with your family and friends (and colleagues, neighbors, clients, or any family of choice! ), you help advance the lifesaving work of TPAN! That’s all you have to do to support TPAN! Click above to sign up as a Host today! Check Out Last Year's Sites & Participants! Not in the Chicago area? Check out national Dining Out For Life to find a city nearest you! Don't forget to follow Dining Out For Life Chicago on social media!